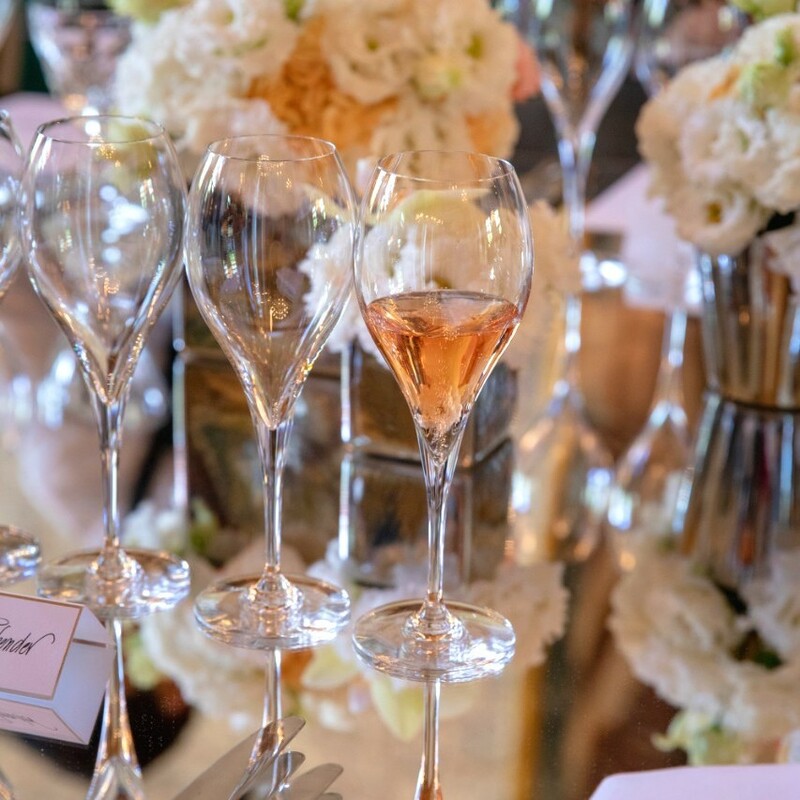 Put a spring day in Paris, the novelty of the collaboration between two iconic names in French history, Veuve Clicquot is Baccarat, and add to the launch of the special champagne La Grande Dame 2008 the kitchen of the youngest starred chef in France. Innovation, courage, daring, but also tradition and memory for a food and wine journey of a day that is worth telling to inspire new adventures, new tastings and – above all – new toasts. Spring has also arrived in Paris, the sun warms the characteristic roofs of the French capital, the Eiffel Tower greets from the Left Bank. We take avenue d’Ièna from the Arc de Triomphe to reach the historic palace that belonged to the Viscountess Marie-Laure de Noailles, which hosts since 2003 the Maison Baccarat. Just put your foot on the first flight of steps to feel the chills of time: get into this hotel particulier it's like stepping into the golden past of sumptuous festivals organized by the famous muse and patron of artists of the time; you feel like Jack Torrance in the Overlook Hotel ballroom, but without fear. The luxurious Parisian headquarters of Baccarat hosts the boutique on the ground floor; passing by the imposing escalier principal on which the imposing one soars chandelier you then reach the museum, the very essence of his works of art. There is also a luxurious restaurant here Cristal Room, of which we had already spoken for his Pink Room. But now it's champagne time La Grande Dame 2008 for the horizontal tasting first among bouteille, magnum is jeroboam, and the tasting lunch after. To complement the boldness of the precious bubble signed Veuve Clicquot there is the kitchen of Julia Sedefdjian, the youngest French star chef. 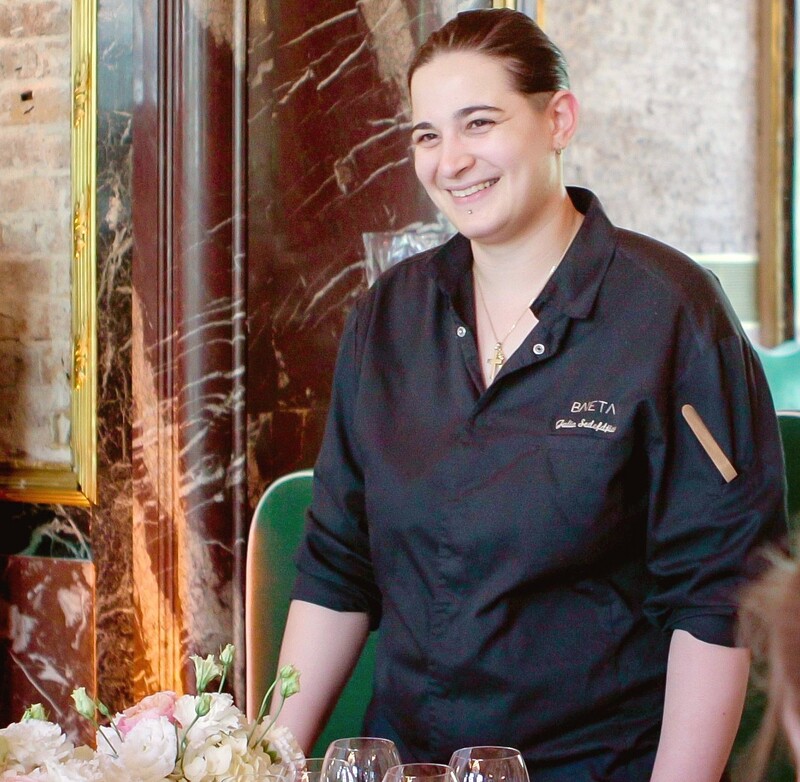 She is not even 25 years old, yet her apprenticeship made her immediately (17 years) and the hard work combined with the right creativity have earned her the position of chef at 20 years old Fables de la Fontaine of Paris, which thus obtains the Michelin star. In March 2018, chef Sedefdjian opens in Latin Quarter the restaurant Baieta, which means "small kiss" in the dialect of the southern French coast, an area to which it is linked because of its beginning in Nice alongside the cook David Faure at the Aphrodite restaurant. Only one year of activity was enough for the chef Julia to win the first Michelin star thanks to the gastronomic offer with Mediterranean flavors, just like we tasted at Maison Baccarat's Cristal Room. To honor the great evolution dated 2008, there is the Master of Cellar Dominique Demarville in person to do the honors and to open the tasting lunch organized in the splendid room with brick walls embellished with mirrors, crystals and cameos. There Grande Dame Rosé 2008 accompanies very well mises en bouchand tantalizing, the Pissaladière with Caramelized Onions and theSmoked Oyster with Celery and Salicornia Emulsion. The white version of champagne, on the other hand, enhances the complex flavor of theentrée, Crispy Egg Yellow with Aquitaine Caviar, Porri and Haddock. Travel through time to the sound of bubbles for the following dishes: Cuvées La Grande Dame 2004 is La Grande Dame 1989 for the fish dish Scallops in Crust of Walnuts, Asparagus, Legumes and Reduction of Champagne and Lemon Confit, while for meat Cuvéés La Grande Dame Rosé 2008 is La Grande Dame Rosé 1989 together with Fillet of Beef and Lobster with Pumpkin, Horseradish, Homardine at Basilicor. The traditional French cheese dish is a must Vieux Comté enhanced by the champagne 1990. In closing, a delicate Demi-Sec Veuve Cliquot Campaigns wraps the cake Vacherin Lychee and Raspberries on Vanilla Cloud and Crystallized Rose Petals. The result? 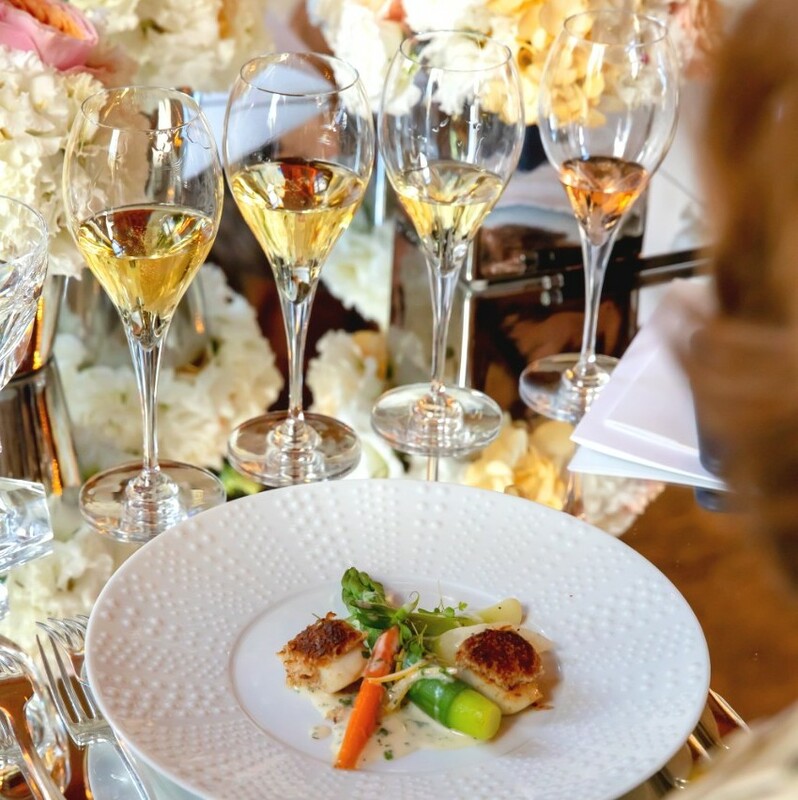 A perfect journey made of flavors and bubbles between innovation and tradition, combining the young creative courage in the kitchen with the historic audacity of the only Champagne Lady. 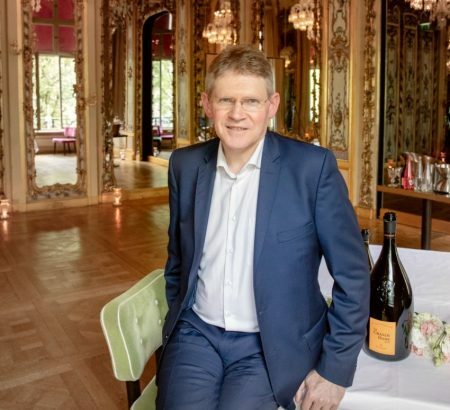 Strong of the risky and successful successes of the "first times" wanted by the widow Clicquot, it chef de caves Dominique Demarville decides to move the quality bar once again. For its first creation of La Grande Dame 2008 reveals an assembly with the 92% of Pinot Noir, the highest percentage in Veuve Clicquot's history. The Mastro di Cantina explains: «My intent is to bring La Grande Dame towards the finesse and elegance that Pinot Noir offers us in these Grand Cru wines. In a sense, this is the Veuve Clicquot touch: combining depth and silkiness with lightness and elegance in this exceptional cuvée . A winning choice that has already earned La Grande Dame 2008 the second place in the Bettane Best Dine Guide + Desseauve 2019 and as many as 95 points from Wine Spectator. Poured into the glass, La Grande Dame 2008 it descends shimmering with golden and brilliant reflections. At the first taste, the attack is initially strong and intense, then the mouth is conquered by notes of dried fruit (almonds, figs and apricots), ripe white fruits (pears) and, finally, tenuous toasted notes of hazelnut and pralines. The seductive pastry notes are well balanced with the freshness and clarity of the assembled, the texture is silky thanks to the young fruits, carried by notes of citrus and red fruits (cherries). It goes perfectly with oysters, royal orange, fish tartar, scallops, scampi, caviar or sesame chicken. From the white lady to the one in pink: La Grande Dame Rosé 2008 it boasts a 14% Pinot Noir red wine from Clos Colin in Bouzy, one of the oldest plots of the Veuve Clicquot domaine. As its name suggests, this special champagne shows off a sumptuous rose gold with light coppery reflections. Soft and full-bodied on attack, it releases all its refinement on the palate starting from the powerful notes of red fruits (raspberry and strawberry) associated with more acid accents (red orange, grapefruit) up to the perfect balance between refinement and spicy fragrances of red berries , Rooibos tea and fine leather. Not for nothing has received 17.5 points out of 20 from Revue du Vin de France. Recommended pairings are beef, shrimp ravioli, lamb, stuffed tomatoes. Don't forget to browse the gallery! It was fun to participate in this first edition of "The World Restaurant Awards"Last night in Paris, in that Brongniart Palace that was once the stock exchange. The prize created by the English journalist Joe Warwick among the founders of "The World's 50 Best Restaurants" and ours Andrea Petrini, influencers and talent scouts of gastronomy, together with the event agency IMG, covered the most disparate and creative categories. 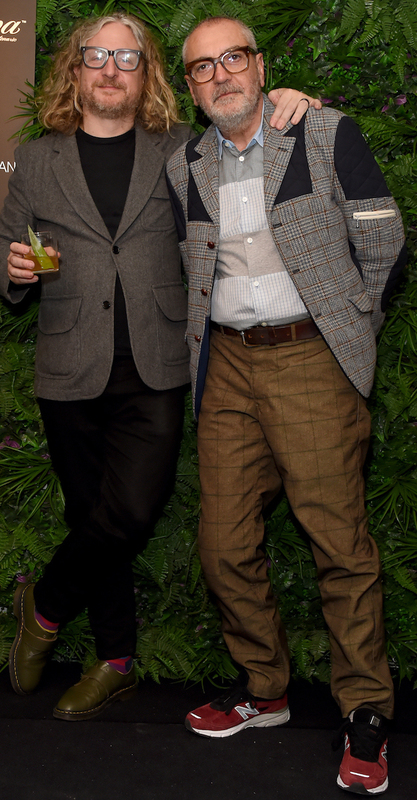 Joe Warwick and Andrea Petrini (GettyImage). With music, including Pink Floyd, and with the television presenter Antoine de Caunes, explosive and funny as always, who spoke a perfect English-speaking guy making the audience laugh (of the series you have to speak French to understand his English), they are nominated shows and winners of 18 categories. The most surreal were the "Tattoo free chef of the year" award Alain Ducasse, which was rewarded for the skin completely diaphanous and free of tattoos with an equally white plate symbol of the event. Monsieur commented that he does not even think about getting a tattoo in this life (too busy with his Ducasse sur Seine, the Bateux Mouches gourmet that has just inaugurated) but that, if it were, you would tattoo a little square of chocolate. Strange also the prize assigned to Alain Passard for the best Instagram profile: the three-star Michelin chef of L'Arpège in Paris, famous for his vegetables, won the award with great confidence: «I do not do anything special, every day is like the first, I love my work". Among the presenters there were also mega musicians like Laurent Garnier, hero of French techno who awarded the prize for the best atmosphere at Jordan Kahn Vespertine, the Los Angeles restaurant with a unique concept where dishes are a magical game, sometimes even empty … "I called architects, noses, musicians to invent my concept," he says. Bravo too Riccardo Camanini Lido 84 in Gardone Riviera, which won the "House special" award with its cheese and pepper cooked in the pig's bladder; and good too Lara Gilmore that with Refettorio and its "Food for Soul" initiative (the non-profit association created to fight social inclusion waste), it received the "Ethical Thinking" award. The restaurant of the year is Wolfgat in Paternoster, South Africa, above Cape Town. Kobus van der Merwe, the chef, every morning he goes to the beach in front of the restaurant to look for the raw material. I think it's worth the trip. On the occasion of #NationalPizzaDay of the USA (February 9), we reflected on how much pizza is now a global dish and we wondered if it is possible to eat good outside our borders. 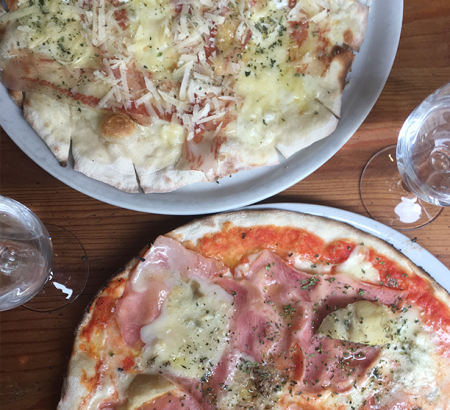 Without going overseas, we did a little investigation in the capital of our cousins ​​across the Alps: it is possible to eat a Paris a Pizza good and tasty like in Italy? Oui, c'est possible! 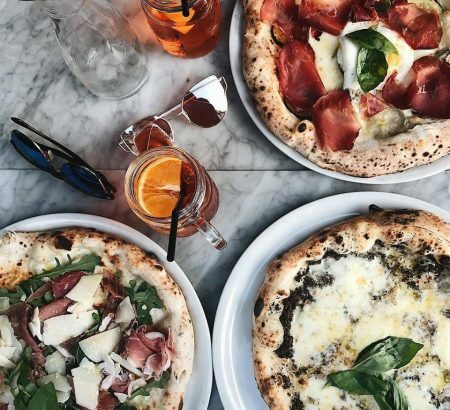 The French are crazy about pizza and, between culinary integration and compatriots emigrated to France, find the 10 best pizzerias of the Ville Lumière is no longer a challenge. Indeed, it is almost more difficult to tighten the search! Plate with age-old roots reinvented in a modern sense a Naples and since 2010, invested by the recognition of the European Union's guaranteed specialty, pizza is loved on a planetary level, leading to a wide variety of pizzas of different styles with different recipes, thicknesses and flours. And in France the speech becomes even more interesting … In fact, according to the consulting firm on catering Gira Conseil, in 2017 in France they have been consumed 745 million pizzas, while Coldiretti indicates 4.2 kilos a year each, after the Americans with 13 kilos and the Italians with 7.6 kilos of pizza per capita per year. If these numbers amaze you, know that in 2013 it was our cousins ​​from beyond the Alps who were the first in the world rankings with 809 million pizzas! With this premise, curiosity led us to plumb the French capital to give you 10 tips on where to go to Paris for a great pizza. 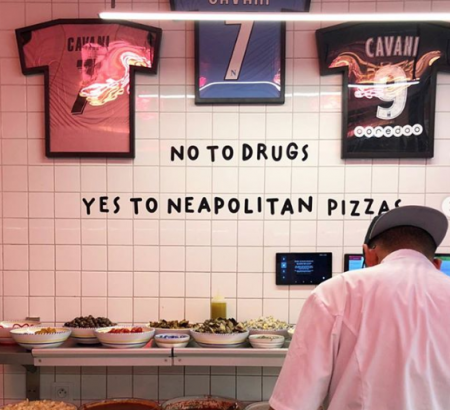 Iovine's, Art of Pizza Everything comes from the family of pizzaioli Nicola Iovine that, together with his brother Emanuele, decides to open his first Neapolitan pizzeria in Paris next to the Louvre, and then conquer other important corners of the city. Here the pizza follows the classic Neapolitan tradition and the choice of ingredients is very careful and accurate starting from the tomatoes of San Marzano D.O.P. and extra-virgin olive oil, all from organic farming. The menu offers several choices, unparalleled Margherita D.O.P. and the Special Calzone, mention of honor also for desserts like the inevitable Baba. Popular Pizzeria Part of the BigMammaGroup that has chosen the young artist Olimpia Zagnoli for graphic design, this pizzeria brings the Neapolitan spirit to the French capital, where in two Acunto three-ton ovens they bake excellent pizzas with original ingredients, from San Marzano tomatoes by Paolo Ruggiero (creator) of the San Marzano Tomato Garden from Sarno) to buffalo mozzarella by Salvatore Corso of the Dairy of Roses, delivered 3 times a week. To guarantee the quality of the pizza menu, which changes every month depending on the seasonality of the products, the veteran Giuseppe Cutraro, executive pizza chef of the group. Also excellent are the white, dark or IPA beers and home-made ice cream made with buffalo milk. Mention aside for the bar, which is said to be the most stocked in Paris with over 500 types of alcohol and cocktails under the bartender's direction Alberto Sinibaldi. Beppe Cutraro of Pizzeria Popolare. Soul On Left bank A pizzeria and "bistrosteria" with an Italian heart and style took life just over a year ago bohemian thanks to the friendship of Marco Marzilli (former manager of the electronic duo Daft Punk) and the restorer David Lanher. In addition to the palate, even the eye is satisfied: a time atelier of tapestries, today the location conquest for the design innovative design of the architect Laurent Croissandeau, careful in the smallest details, like the enamelled wood oven by Stefano Ferrara, the marble counter or the fabric wallpaper inspired by Giò Ponti. The chef directs the kitchen Matteo Testa, which chooses exclusively high quality products in accordance with tradition. from Margherita Soul with organic tomato fillets, buffalo mozzarella, parmesan and basil, up to Sausage and Friarelli classic, the menu offers about twenty pizzas that cancel the homesickness. 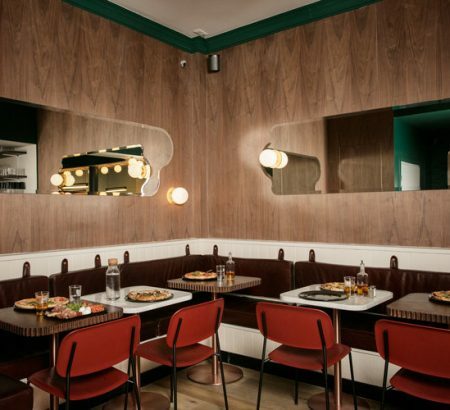 From Graziella Behind the local historian Les Folies Bergères in the 10th arrondissement, there is a small and delightful pizza restaurant with an unmistakable Neapolitan style. Everything comes from the passion of Goodbye Graziella, who wanted to rebuild a piece of his Naples in Paris, and from the vision of the entrepreneur Arnault Lacombe, head of the group Savoir Vivre. In addition to traditional pizzas cooked in a wood oven, in the menu are also the fried pizzas, hard to find abroad, and above all so good! Along with the passion, the quality is found in the selected and delicious ingredients: from the buffalo mozzarella of Campania D.O.P. to the variety of tomatoes (San Marzano D.O.P., of piènnolo del Vesuvio, corbarino), until O 'Pelatiello, the black pig from Caserta for cured meats. Indispensable to book in advance to enjoy a pizza among the delicate colored majolica. Fried pizza from Graziella, Paris. Popine After a visit to the romantic and melancholy cemetery of Père Lachaise, reach boulevard Ménilmontant to cheer you up with a warm and tasty pizza from Popine, a name chosen from the Latin: «In practice, the popina was the typical Italian trattoria in which wine was served to accompany meals, she says Gennaro Nasti, chef pizzaiolo, master in dough and leavening. In Paris since 2014, after a year and a half at the pizzeria Rebelled Family, opens Popine and shortly after Bijou in Montmartre. His pizzas menu impresses with the variety between red, white and gourmet created with extraordinary quality ingredients, from flour Madonita de Molini del Ponte with tomatoes up to Foie gras. 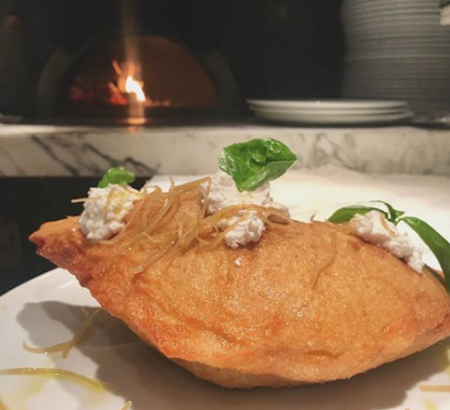 The chef follows the Neapolitan tradition for his leavened dough 40 hours to create a light dough with a studied mix of flour with a fine result in the center and high on the edges. The traditional pizzas with an original touch like this are very appreciated Marinara or the Daisy, special mention for the Calabrese with the famous spicy dish. 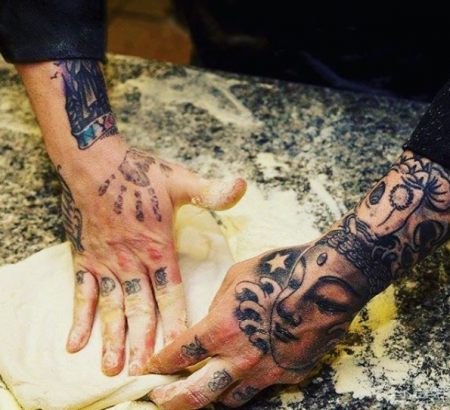 The unmistakable hands of chef pizzaiolo Gennaro Nasti. Daroco It will be for the extraordinary location fashionable (formerly boutique of Jean Paul Gaulthier in the wonderful Galerie Vivienne) or for the original design and the neoliberty furnishings on 400 square meters that AD Magazine defines it as the place where to find the coolest pizzas in Paris, but Daroco does not disappoint even the gastronomic expectations. The pizzeria follows the rules of the chef Federico Schiavon and of the chef pizza chef Lamine Keslani, Which focus on selected choices from the excellent ingredients: in addition to the classic ones like the Daisy, the pizza with pumpkin cream, sausage, scamorza and rosemary and the one with fior di latte mozzarella, gorgonzola, smoked scamorza, parmesan and chestnuts deserve a curious taste. The last arrived? Is called Boulevard des Allongés and it is with mozzarella fior di latte, mortadella, stracciatella and pistachios from Bronte. Book a table upstairs so you can also enjoy the view from the top of the uniformed waiters marinière whiz along with incredible dishes among the marble tables, mirrors, creepers and white brick walls. La Pizza des Rois, Daroco. Dalmatian Only in Paris could one think of one limited edition pizza: each service is cooked 101 pizzas, then the wood-burning oven goes out. Not one more. Inspired by the name of the film Disney and with the firm aim of ensuring excellent quality, the two French owners Julien Bouaziz is Romain Bertin they studied Neapolitan cuisine for a long time before opening their project. This is why they called for reinforcements from Italy: under the watchful eyes of the director Zeno Francesco Salamone100% Neapolitan staff moves fast and capable, as well as the ingredients, also carefully chosen (Bizzarella di Battipaglia from Paraggio brothers, Cetara tuna, San Marzano dop tomatoes, stracciatella from Andria, all slow food products regularly imported from 'Italy). Neon colored and pink details make the pretty restaurant a great candidate for a selfie #foodporn! Atelier Bizzo After the Neapolitan pizza or in limited series, now we recommend the made-to-measure pizza. Just like in a tailor-made atelier, you can choose the base you prefer either as a dough (with thick Neapolitan or Roman-style edges) or as a sauce (traditional with San Marzano tomato and basil or fried with tomatoes, salt, garlic and herbes de Provence or even without), and then you can request the ingredients you want following the combinations dictated by your appetite (mozzarella fior di latte, parmesan, buffalo raw, artichokes, aubergines, dried tomatoes, friarelli, Parma or San Daniele raw, spicy sausage and so on). For the undecided, they remain on the menu Daisy, the queen (ham and mushrooms) and the Four cheeses. 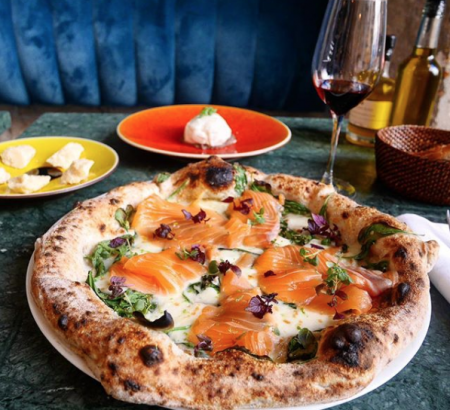 Also reported by Vogue Paris, Atelier Bizzo's pizza owes its success to the fresh and selected ingredients, most of which are imported directly to Italy. Beating heart is the extraordinary wood-burning oven in burgundy mosaic immersed in a minimalist design that seems to be inspired by a painting of Edward Hopper, thanks to the famous interior designer Dorothée Meilichzon. If you are unsure, read the 5/5 reviews of TripAdvisor. Atelier Bizzo, as in a painting by Hopper. The Brigante Located in the 18th arrondissement on the north side of Montmartre, This pizzeria satisfies the palates of enthusiasts since 2013 and declares itself «décoration minimalale pour pizza maximales. 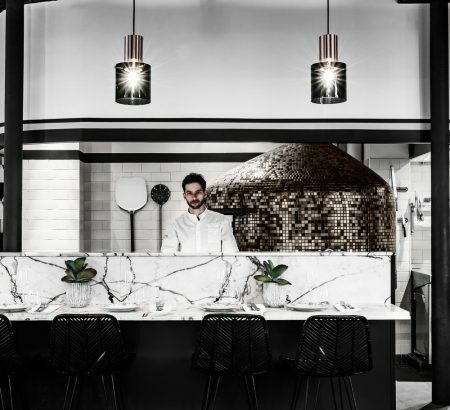 Minimalist location, it expresses all its warmth through the thin, crunchy and abundantly seasoned pizzas of the chef Salvatore Rotiroti, Calabrese of origin. Flour from Puglia and leavened dough from 36 to 48 hours, its pizzas enjoy excellent imported ingredients: black truffle mortadella, mushrooms, mozzarella and buffalo ricotta for the mortazza; Neapolitan sausage, turnip tops and scamorza for the Ronzatti; tomato, mozzarella, soppressata, olives and pecorino cheese for the Cardinale; and so on for over twenty really inviting pizzas. He added to the menu the opportunity to taste a slice of each type of pizza he created for a total of 10 slices, a sort of Parisian giropizza. Guillaume Grasso The True Neapolitan Pizza Naples-Paris ticket to success for the Grasso family, which opened the first Neapolitan pizzeria in 1916 Gorizia. Like his grandfather Vincenzo in Paris, today he is Guillaume Grasso to serve its customers the traditional recipe of family pizza with a certificate Vera Pizza issued by the True Neapolitan Pizza Association; only 5 in all of France! «A simple and tasty dish that requires a rigorous skill and the use of quality products. To obtain a soft and slightly crunchy dough, I use a specific Italian flour and let it rest at room temperature for a light and digestible result , says chef pizzaiolo. 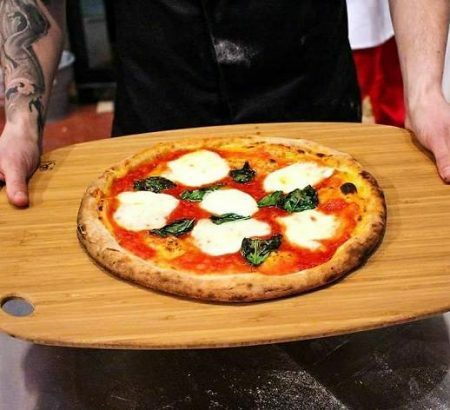 In the wide menu, there are Pizzas d'Autore (among which the Bufala and Parma with buffalo mozzarella, cherry tomatoes from the Vesuvius, Parma 24 months and Parmigiano 24 months) alongside the classic pizzas like Margherita Verace with Corbara ( Corbara tomatoes, fior di latte, basil, olive oil, grana padano). Time Out declared it the best pizza in Paris in 2018. 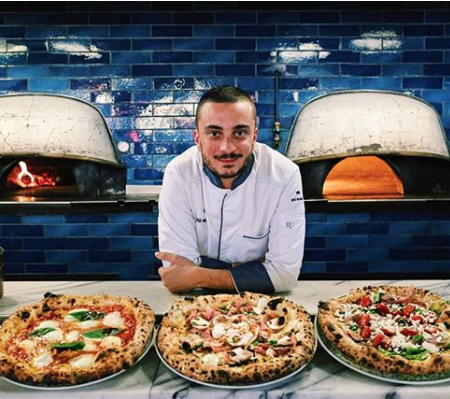 Guillaume Grasso and the real Neapolitan pizza. Ekim We close the tracking with the pizza from the future: Ekim is a French startup that will open the first automatic pizzeria … with a robot pizza maker! The company presented in June 2018 the project to Blade Runner that is based on the movements of programmed robots based on those of human pizza makers. 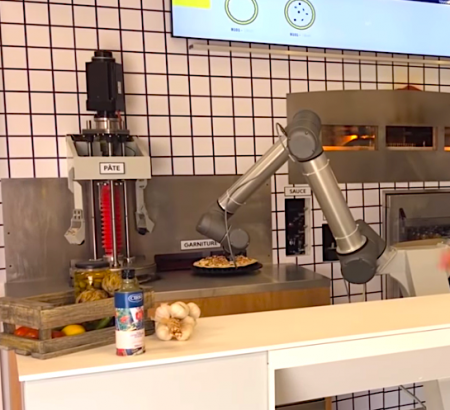 While the time of preparation of a pizza from the spreading of the dough to the filling, until the cooking remains the same, the advantage proposed lies in the three arms of the robot coming to triple the productivity of a human being: from 40 to 120 pizzas per hour, according to the data cited by the CEO of Ekim, Philippe Goldman (here in video). They have opened an Instagram profile and are looking for the perfect location where customers can order pizzas via touch screens by paying via POS. Keep an eye on tomorrow? The robot pizza maker of Ekim, a French startup.